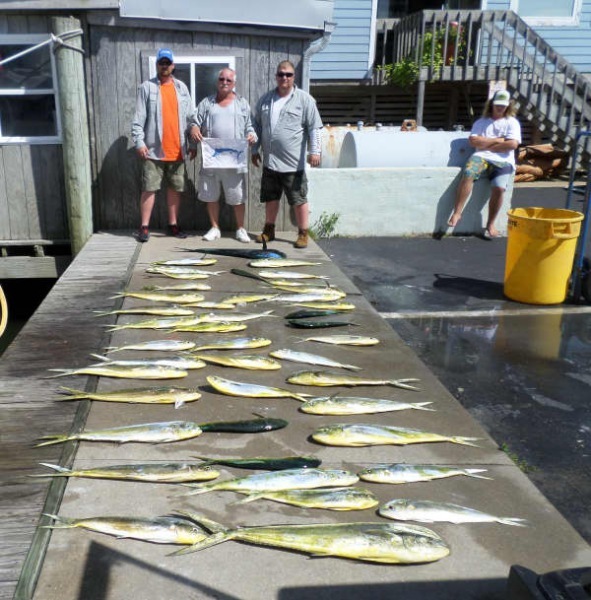 Another good day of fishing out of Hatteras Harbor Marina. 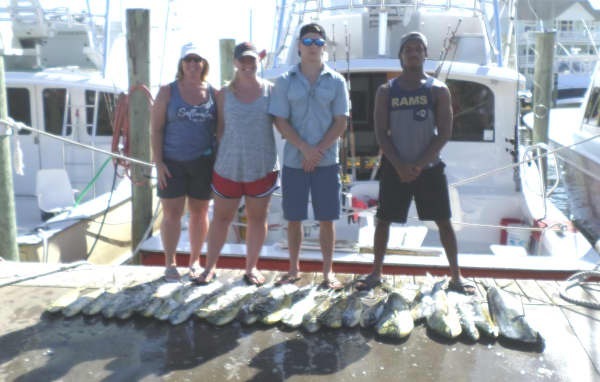 Inshore anglers returned with good catches of Bluefish and some "keeper" Red Drum. They also offer clamming excursions and even sight-seeing excursions. 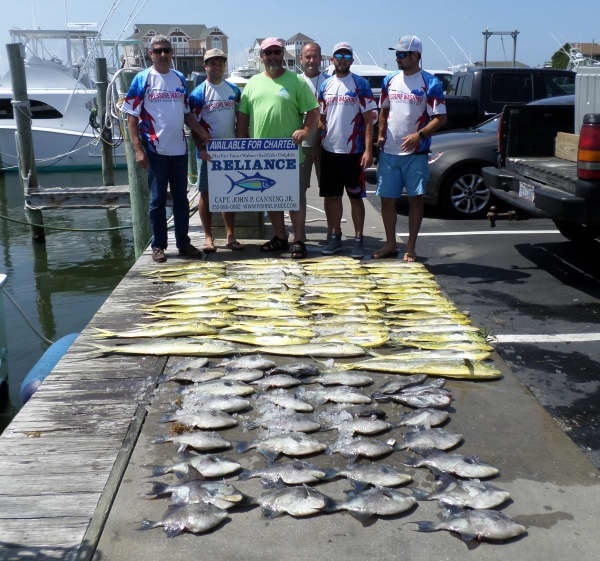 There are many ways to have fun while boating in the Pamlico Sound. 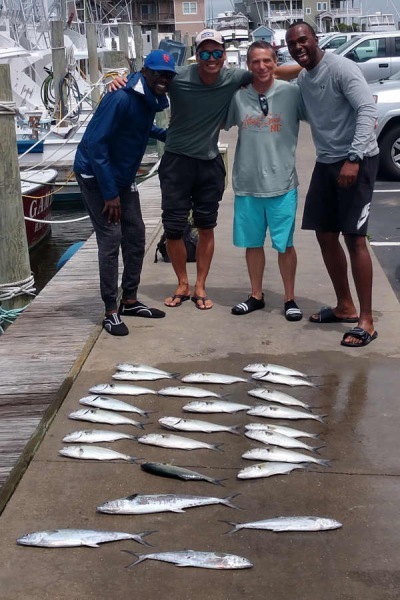 Anglers who fished offshore experienced a good Billfish bite! Two Blue Marlin, one White Marlin, and four Sailfish were released today, keeping everyone on their toes! 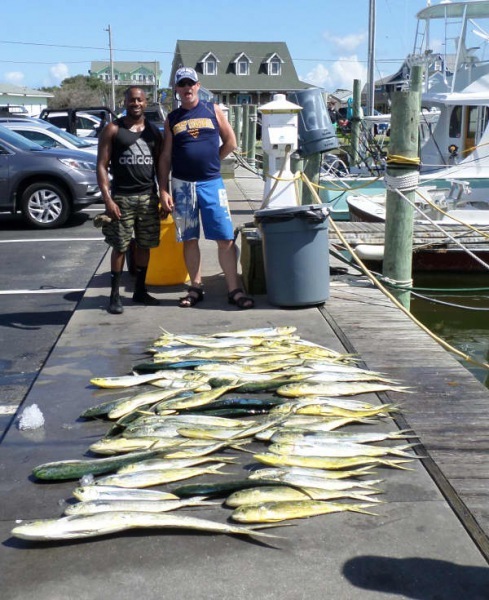 The Dolphin bite was not red hot, but many good catches came in. 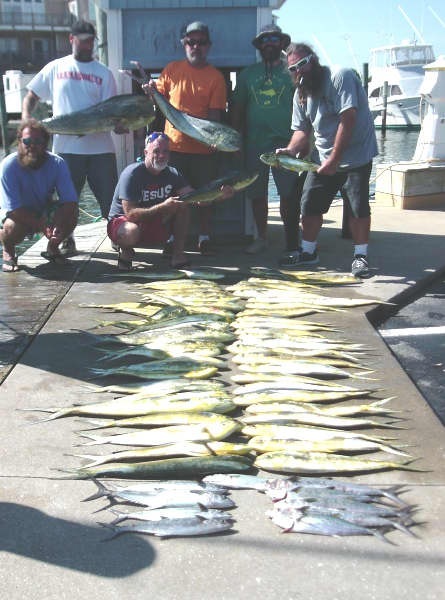 A few Wahoo and Blackfin Tuna helped to produce some variety. 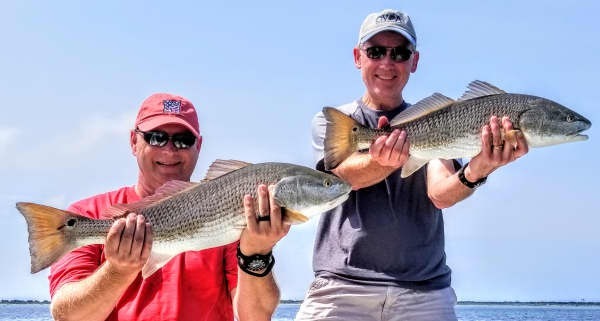 It was an extremely hot day all across the south and the best way to beat the heat is to get out and about on the water and have a great time fishing! 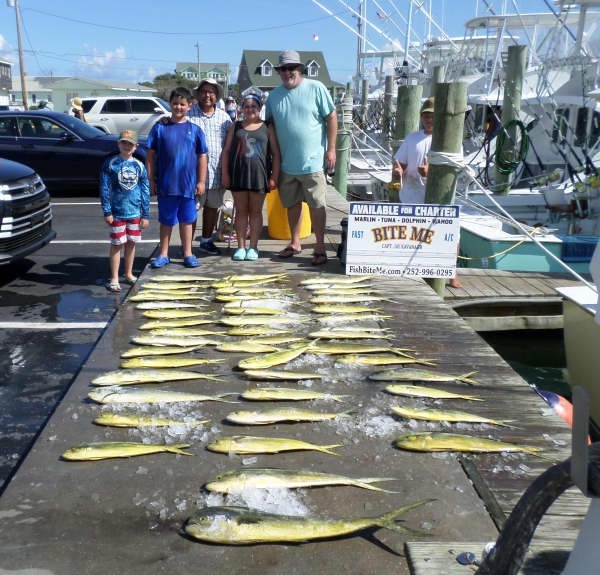 Ernest Bertok of Virginia Beach, VA: Sailfish release on Bite Me. 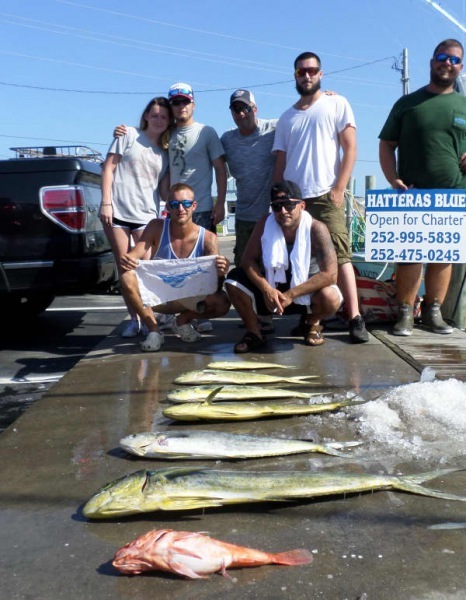 Taylor Bertok of Virginia Beach, VA: Sailfish release on Bite Me. 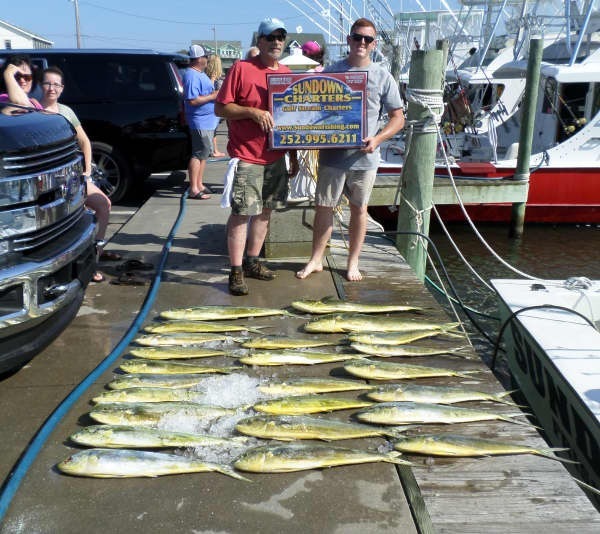 Arthur Cummings of Midlothian, VA; Blue Marlin release on Release. 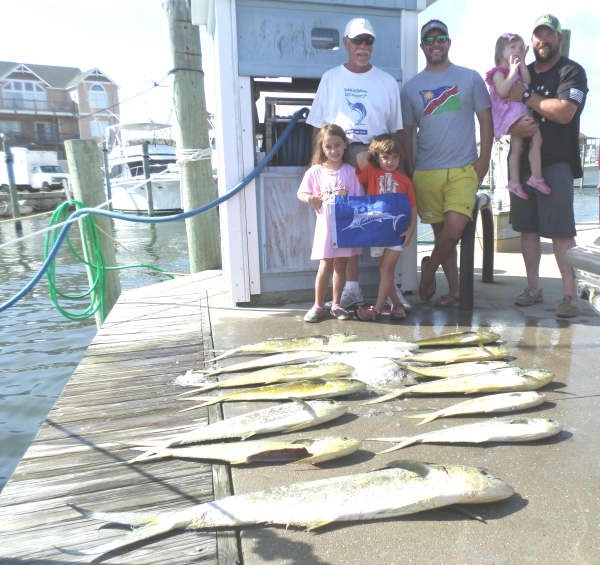 Emery Siegrist of Chester, VA: White Marlin release on Tuna Duck. 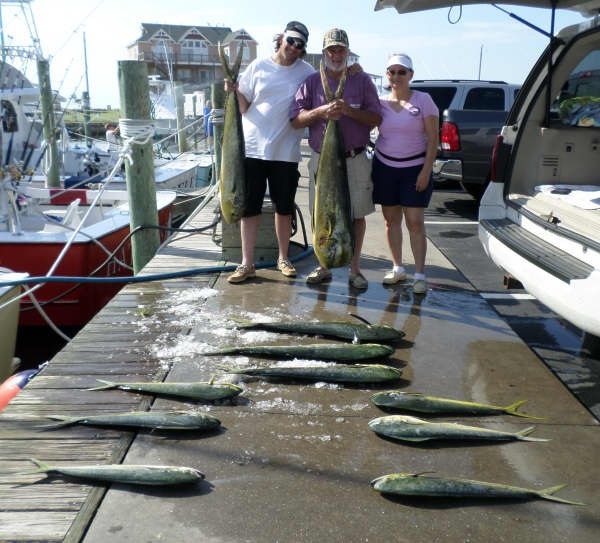 Robert Grubbs of Chester, VA: Sailfish release on Tuna Duck. James Trimble of Newport News, VA: Sailfish release on Chaser. Happy 4th of July! 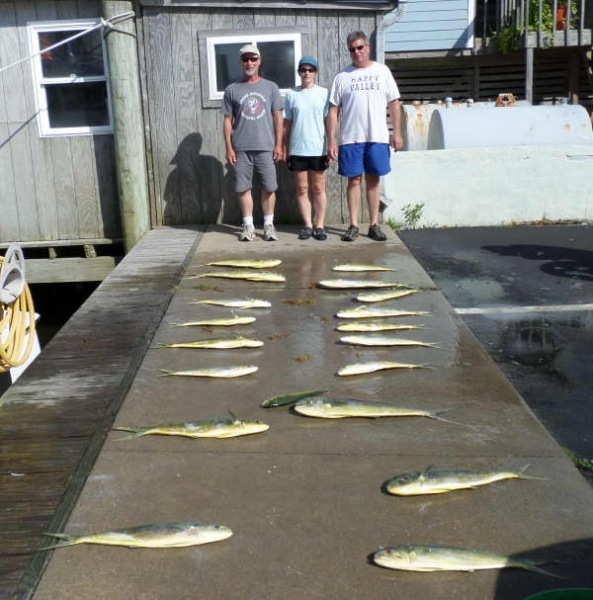 Bluefish was on tap for inshore anglers all day. 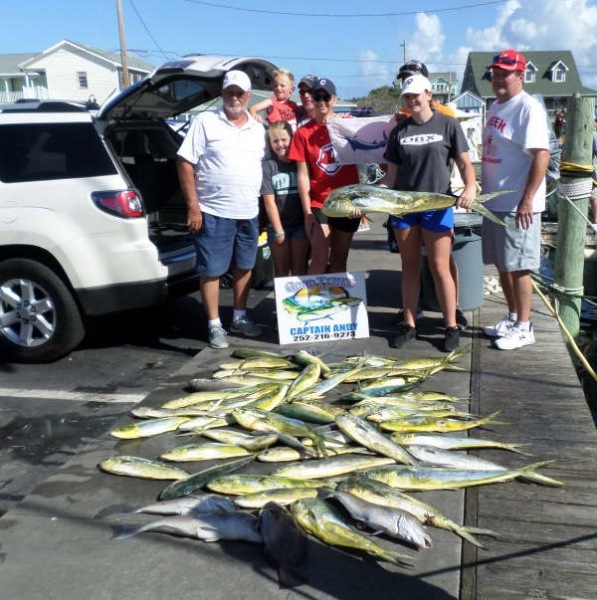 A few Spanish Mackerel and a handful of small Cobia were caught as well. This afternoon one group went out clamming and enjoyed being in the water digging for their dinner - what a great meal for a hot Summer evening! Three Blue Marlin and one Sailfish were released by our offshore fleet. The Dolphin bite continues to be good with some boats returning with limits. 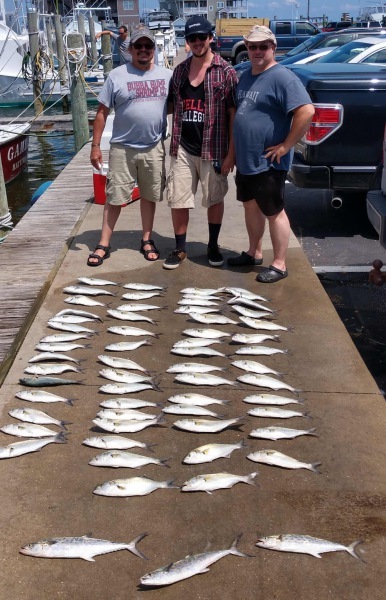 A few King Mackerel were caught and bottom fishing was good with Triggerfish, Tilefish, and Grouper. Enjoy the fireworks tonight and be safe! Ronald McHenry of Glenville, WV: Blue Marlin release on Sea Creature. 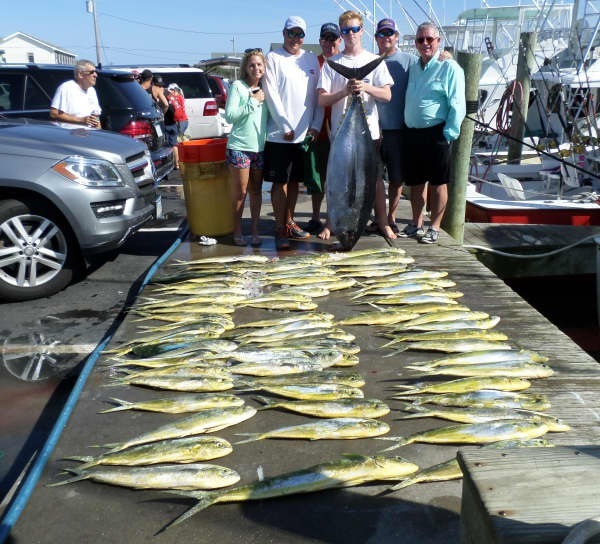 Edward Johnson of Chester, NJ: Blue Marlin release on Hatteras Fever II. Taylor Whitley of Williamston, NC: Blue Marlin release on Release. Randy Domingue of Chapel Hill, NC: Sailfish release on Tuna Duck. Hot weather and hot fishing go hand in hand right now. Our Offshore fleet was racking up billfish points with Good Times, Native Son and Release all releasing White Marlin. 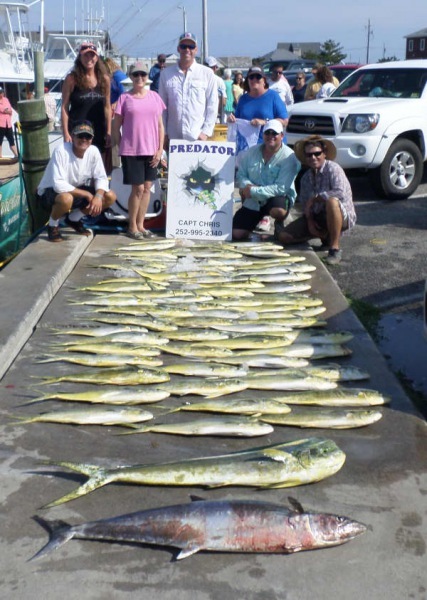 Bite Me, Good Times and Predator released Sailfish. 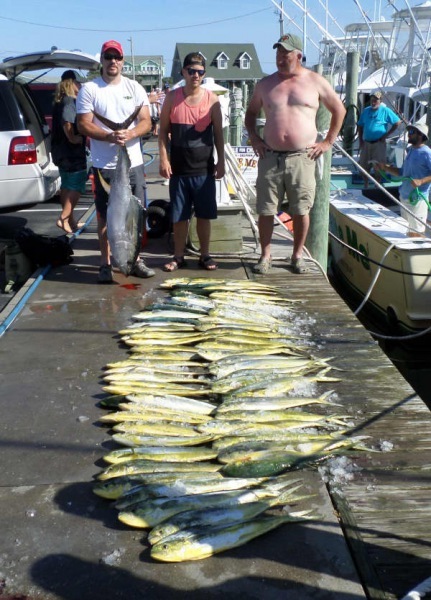 Dolphin were limits on the dock (10/person) with some Tilefish and Grouper rounding it out. 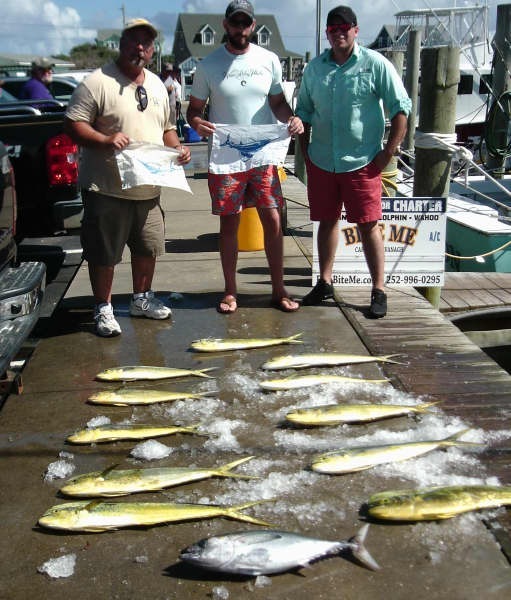 Inshore boats were doing well with Spanish Mackerel, Bluefish and a few Cobia. Predator: Alessandra Necamp of Washington, DC released a Sailfish. Good Times: Adam Fisher of Hagerstown, MD released a White Marlin. 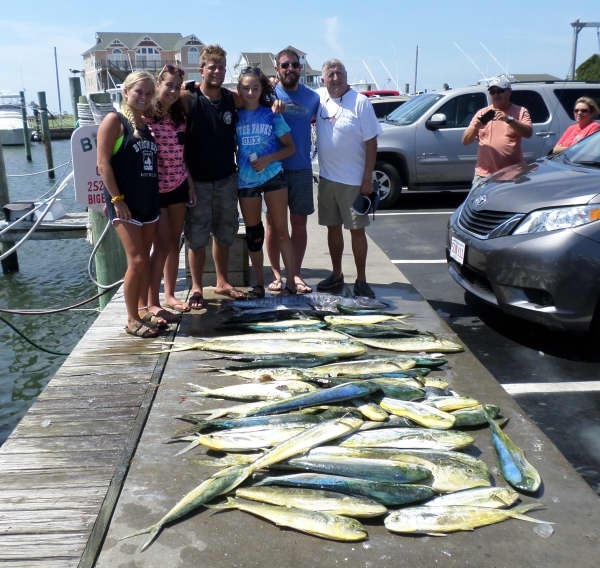 Tuna Duck 11 year old Aliya Shiley of Queenstown, MD caught a 36lb Dolphin. Native Son: Hunter Davis of Richmond, VA released a White Marlin. 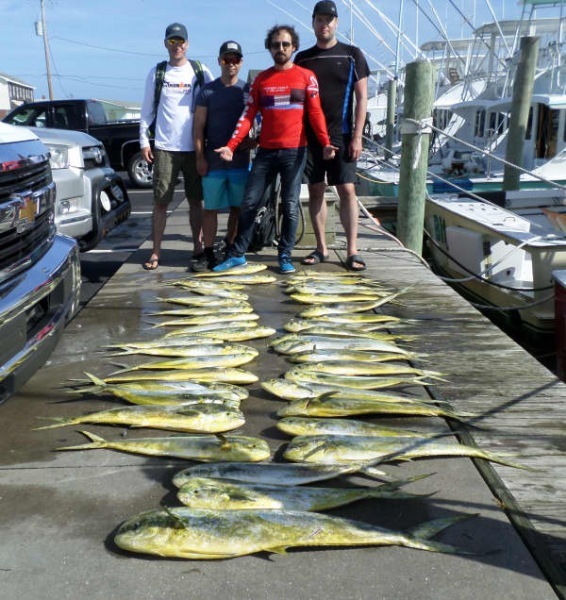 Bite Me: Casey Shauahan of Rockville, MD caught a 36lb Dolphin. David Barnes of Leesburg, VA released a Sailfish. Release: Shane Parsnow of Concord, NC released a White Marlin. 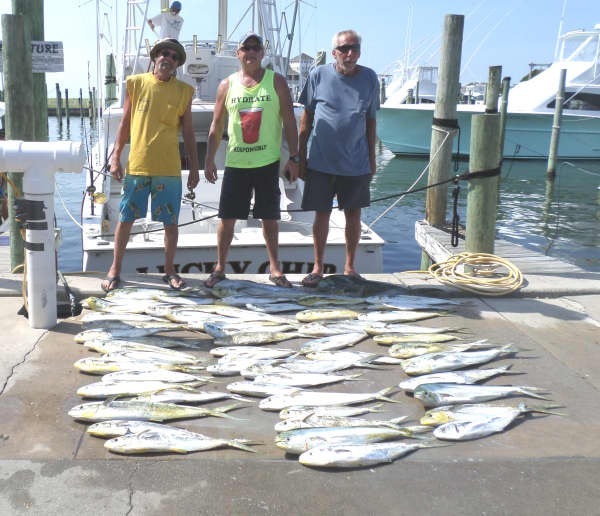 Inshore is coming in strong for the fishing fleet with lots of Bluefish, Spanish Mackerel and Red Drum. 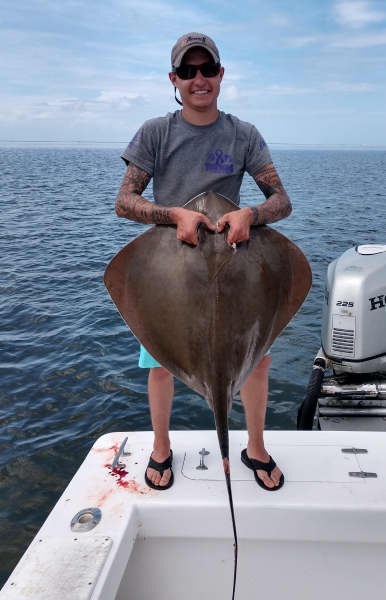 Some bow fishers today were bringing in Southern Stingray. 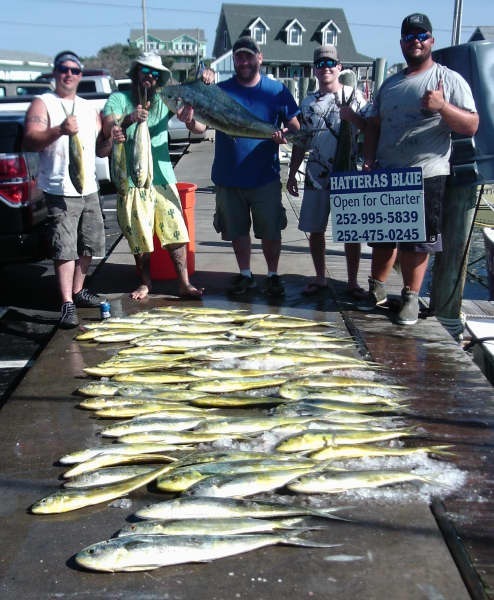 Offshore fleet continued blitzing the Mahi with limits on most boats as well as a few Tilefish. Carolina Girl released a Blue Marlin. Chaser and Good Times released White Marlin and Sea Creature released a Sailfish. 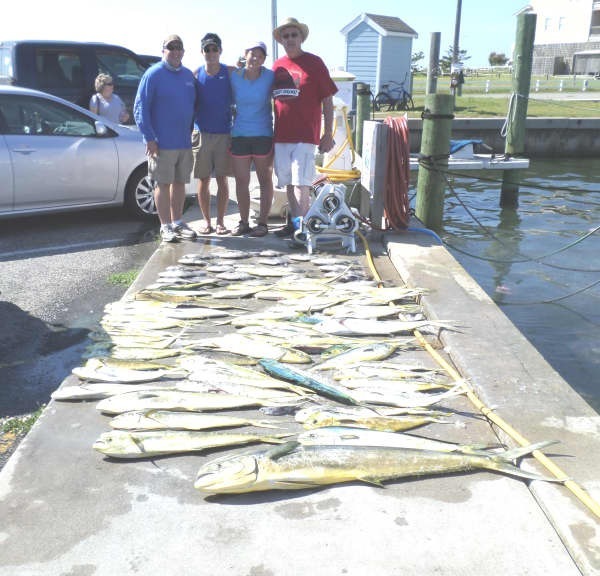 Good Times: Graham Cloeter of West Chester, PA.
Carolina Girl: Gary Root of Oak Ridge, NJ caught a 37lb Dolphin. 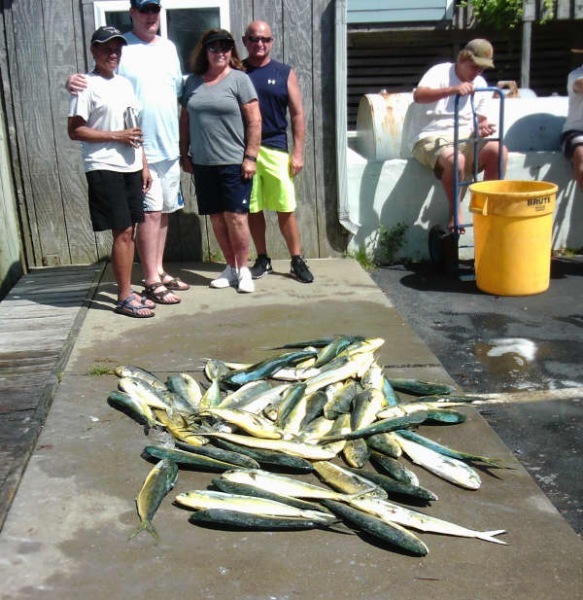 Brenda Post of Newton, NJ caught a 35lb Dolphin. James Post of Newton, NJ released a Blue Marlin. Sea Creature: Eric Holt of Lexington, SC released a Sailfish. 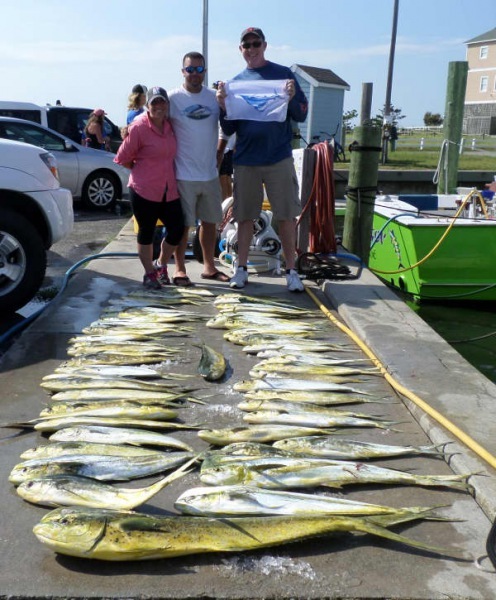 Chaser: Paul Stacks of Windsor, NC released a White Marlin. Sound Bound: Christopher Samchuck of Millville, NJ released a 48" Red Drum. Well hello July! You certainly showed up with some very hot weather and blue skies! A lot of people here to visit this week for what looks to be great weather. Lots of boats out fishing Offshore and Inshore, we have boats available all week for both. 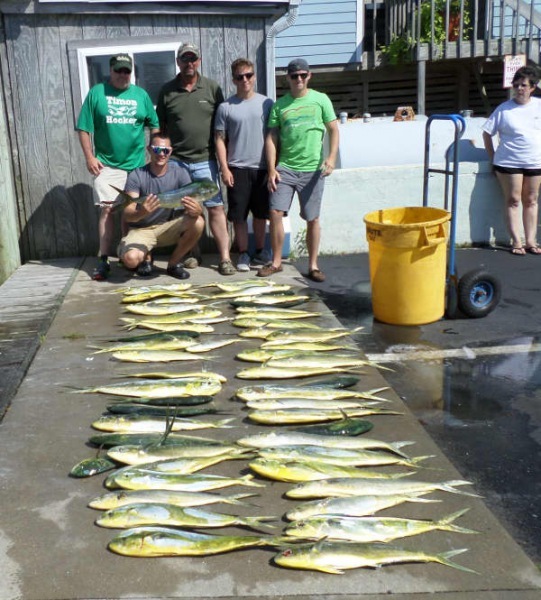 Offshore boats were catching limits of bailer size Dolphin. Predator and Release both released Blue Marlin. 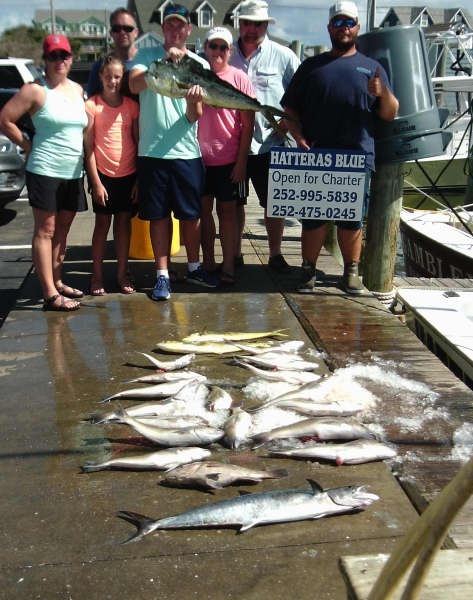 Inshore boats were seeing and catching Cobia, Spanish Mackerel and Speckled Trout. Predator: Morgan Swartz of Mifflintown, PA released a Blue Marlin. 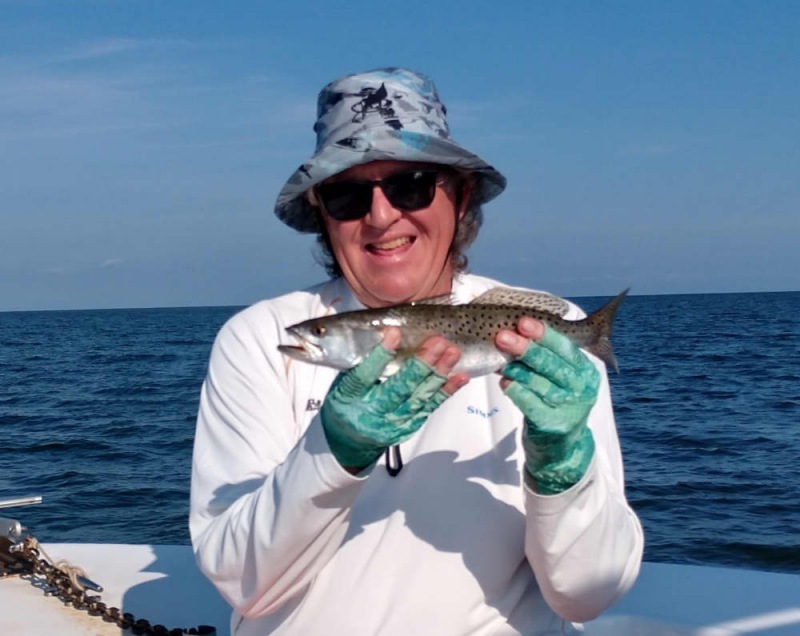 Clough Ford (private boat): Colin Lewis of Windsor, NC released a Barracuda. Release: Lamont Lavender of Aliceville, AL released a Blue Marlin. Summer is here and the heat is on! 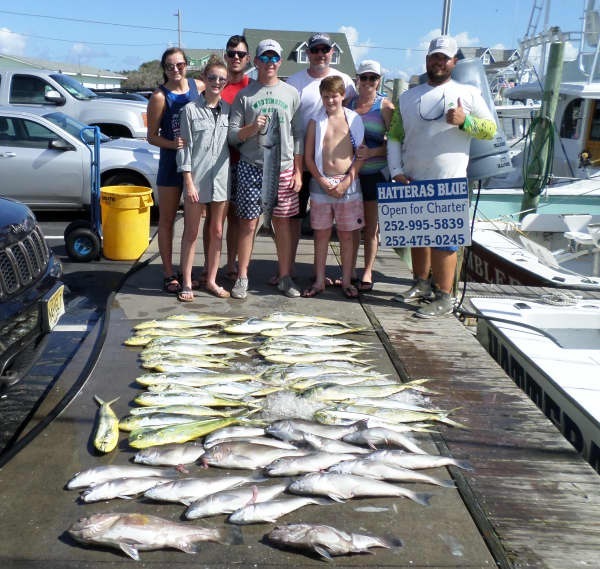 What better way to beat the heat than to get out on the water and go fishing - We offer inshore near shore and offshore charters. 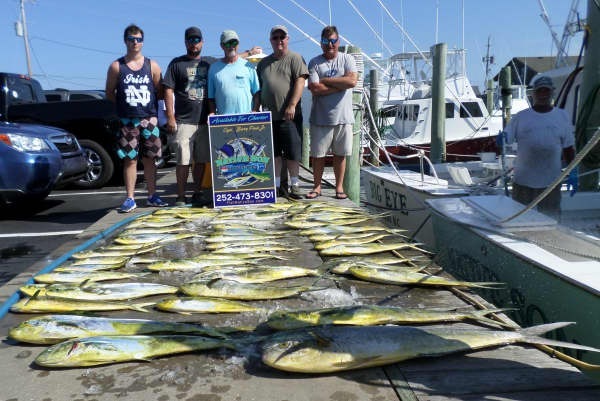 Give us a call at 800-676-4939 and we'll be glad to hook you up with the trip of your choice! 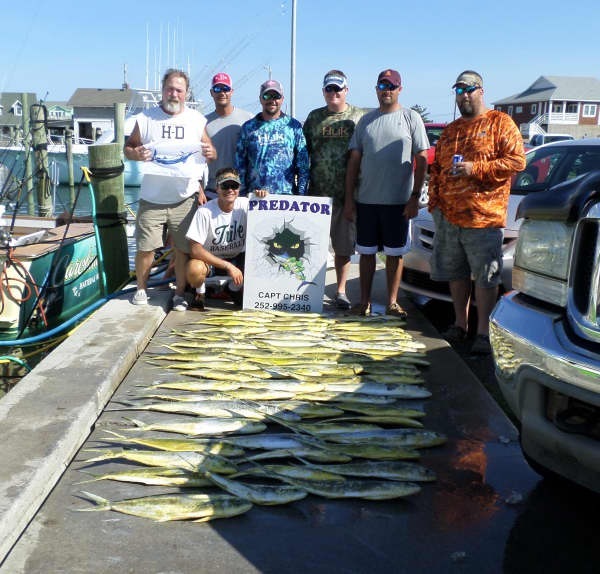 Inshore charters went out into the Pamlico Sound and they got on Spanish Mackerel and Bluefish. 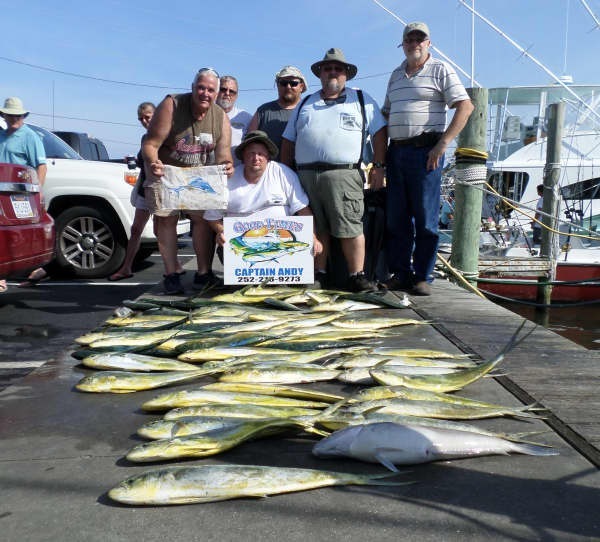 The Dolphin bite continues to be real good and anglers stayed busy bailing them offshore. The Tuna bite had slowed down, but a real nice Yellowfin was caught, as well as a real big Bigeye Tuna! 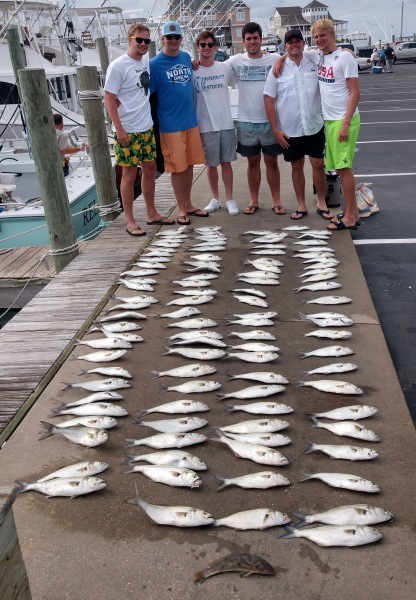 Bottom fishing was good with Triggerfish and Black Sea Bass being reeled in. There should be some good grilling action tonight. Good Times and Predator released Blue Marlin. Bite Me released two Sailfish. 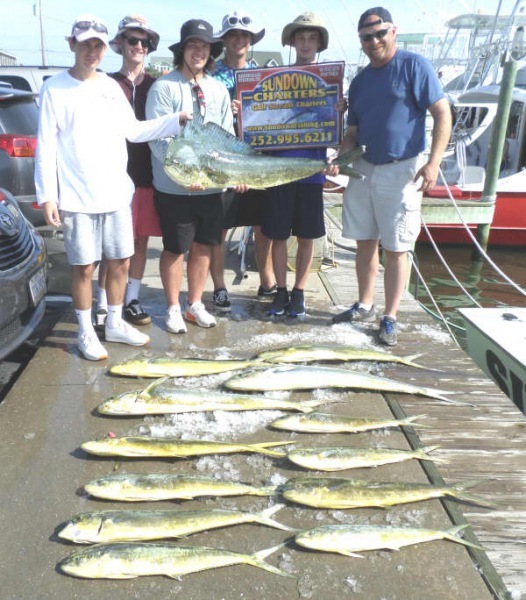 Way to go anglers! Jason Crockett of Colonial Heights, VA: Blue Marlin release on Good Times. Michael Mevillo of Alexandria, VA: 6 lb. Triggerfish on Adventure. Shane Tu of Danville, VA: 36 lb. Dolphin on Carolina Girl. 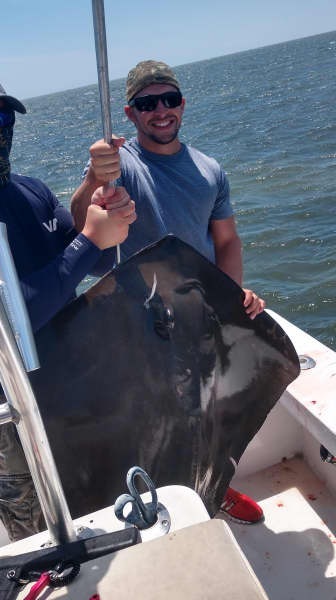 Blake Huling of Centreville, VA: 151 lb. Bigeye Tuna on Release. 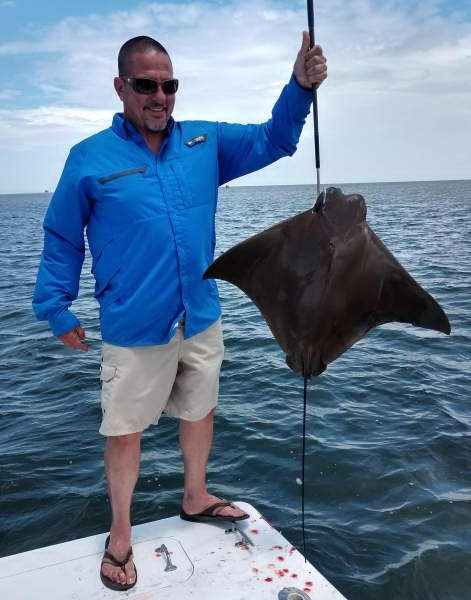 Kevin Effler of Goldsboro, NC: Sailfish release on Bite Me. 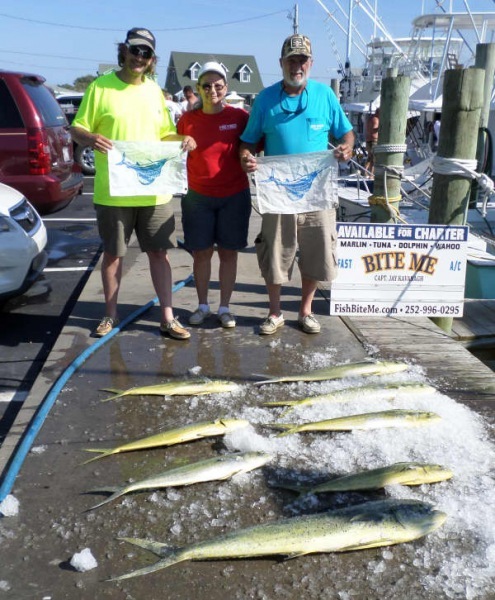 William Effler of Goldsboro, NC: Sailfish release on Bite Me. Milton Harver of Ford, VA: Blue Marlin release on Predator. It was "fun day" Friday here at HHM. 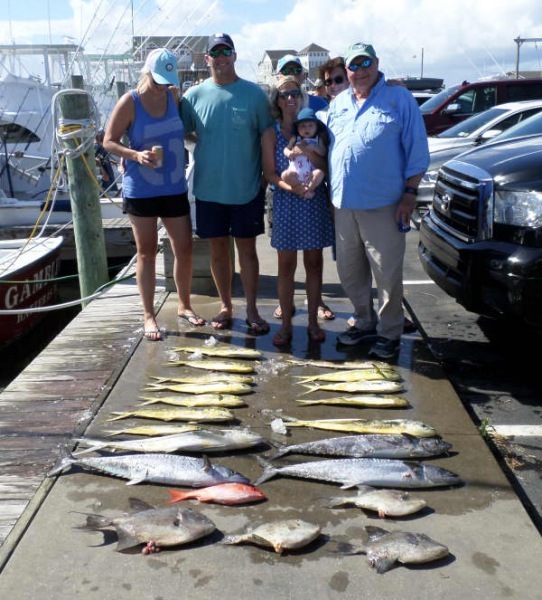 Lots of anglers and family groups went out into the Pamlico Sound for a half day of inshore fishing. 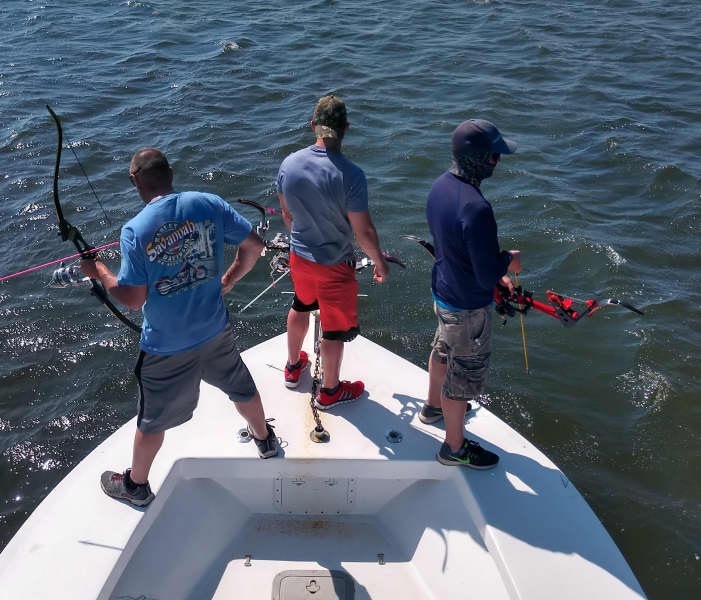 The morning groups caught Red Drum and Bluefish. 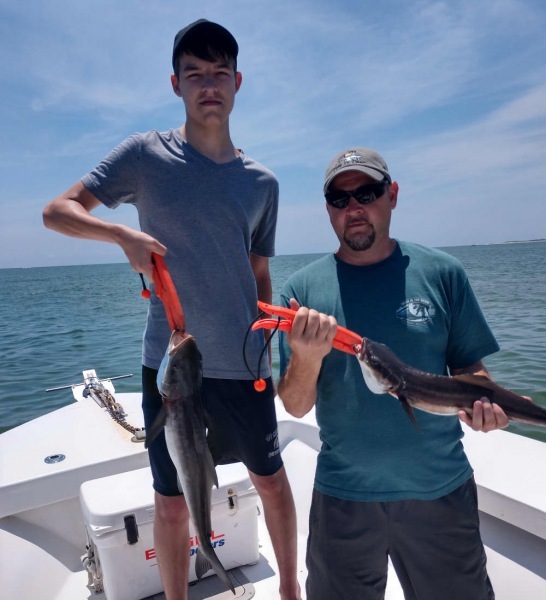 Afternoon groups went after Cobia with success. 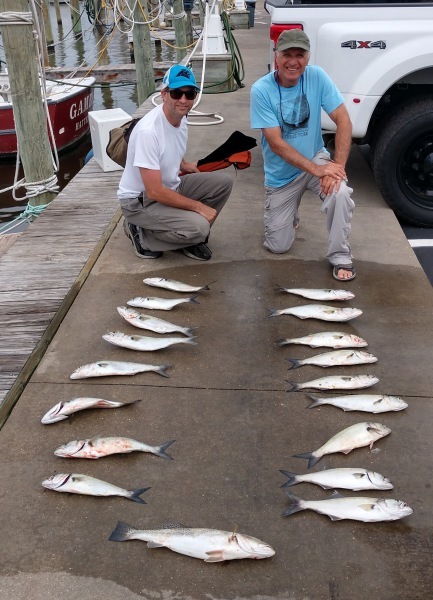 A few Bluefish were biting as well. With the heat index so high, it was a good idea to get out on the water to cool off. 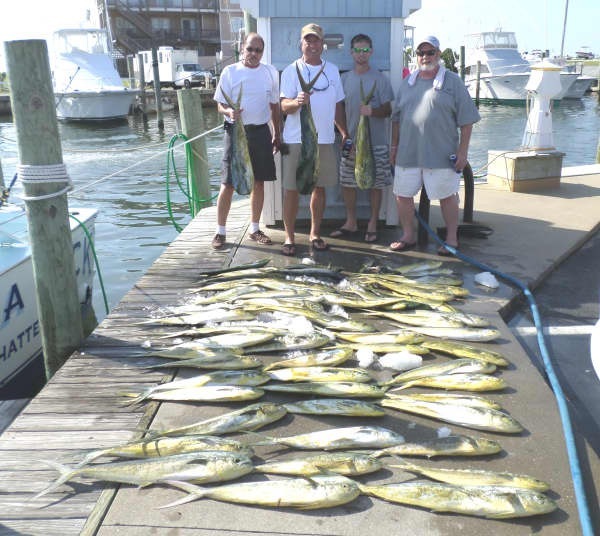 Overall, offshore fishing was real good with limits of Dolphin brought in. Bottom fishing provided a good Triggerfish bite. A few King Mackerel hit the lines late this afternoon. Gambler released a Blue Marlin. 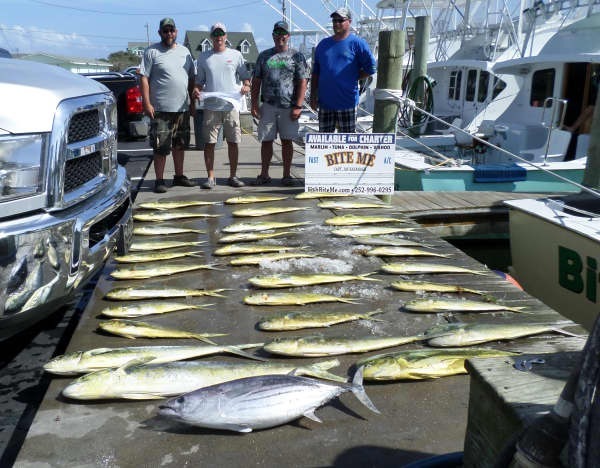 Hatteras Fever II released a White Marlin. Carolina Girl, Good Times, and Predator released Sailfish. 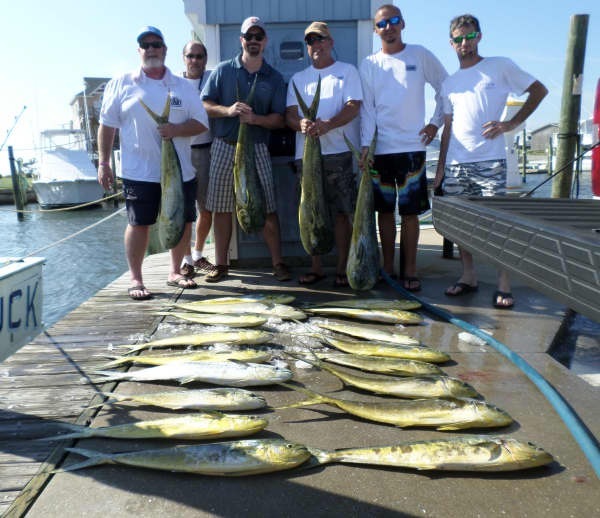 June is almost over - don't let July come and go without a "fun day" of fishing. Sylvain Doucet of Coteau Du Lac, QC: Blue Marlin release on Gambler. 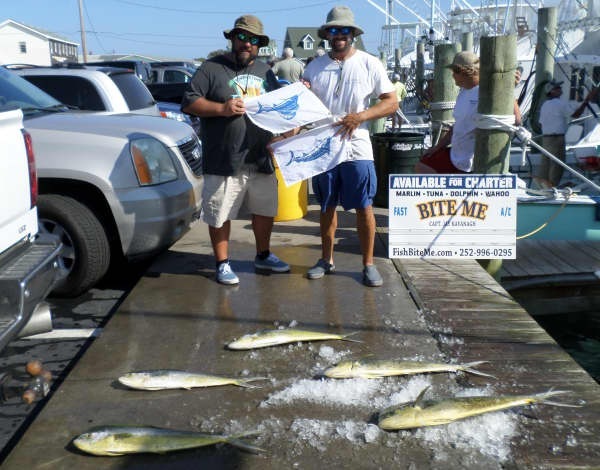 Ryan Wig of New Egypt, NJ: White Marlin release on Hatteras Fever II. James Whitacre of Martinsburg, WV: Sailfish release on Good Times. Kelly Waterman of Grove City, OH: Sailfish release on Carolina Girl. sarah Lopez of Yorktown, VA: Sailfish release on Predator. 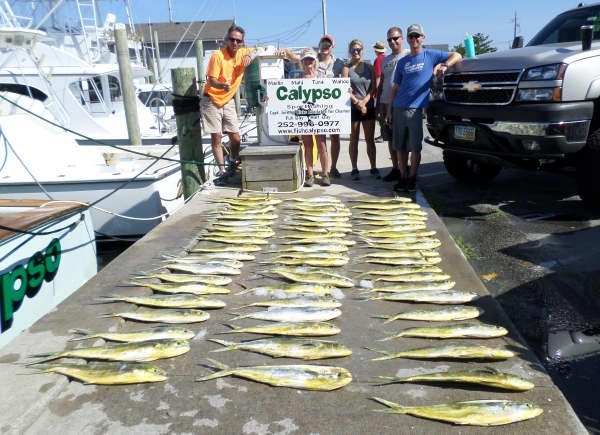 Wow, Summer is certainly underway on Hatteras! 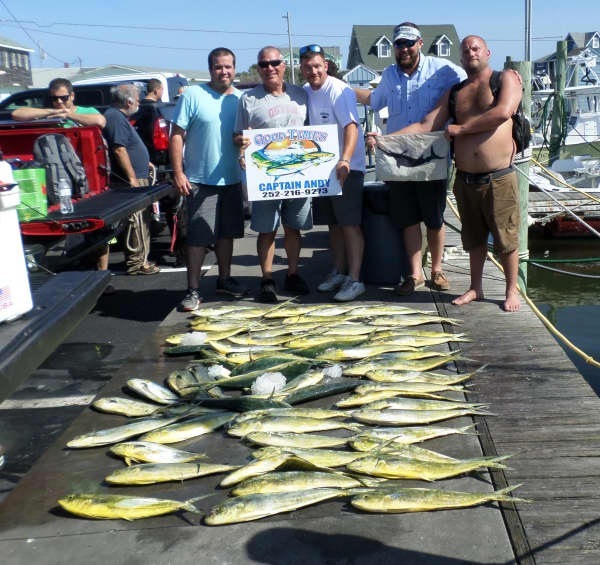 Once again our fleet kept busy getting anglers out to the fishing grounds. 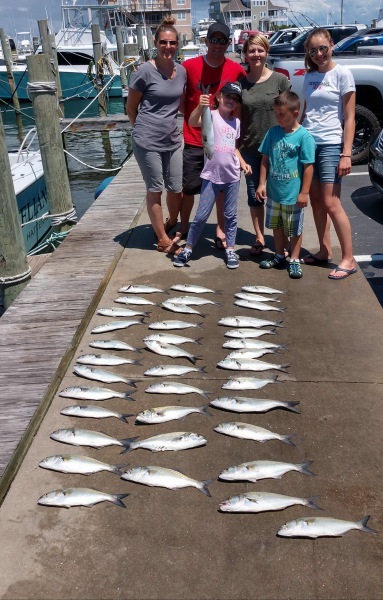 Inshore and near shore groups had a great morning catching Spanish Mackerel and Bluefish. 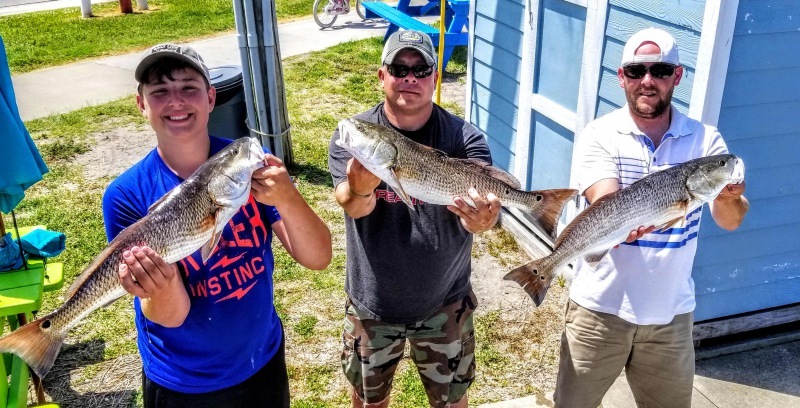 A few Red Drum were targeted and caught as well. 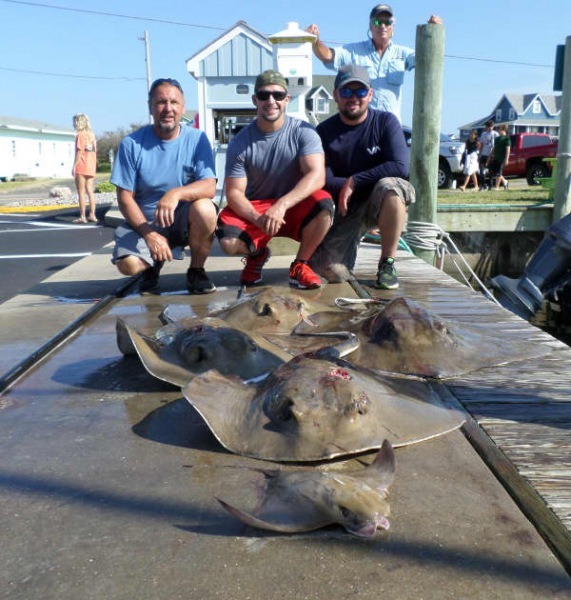 A group of anglers went bowfishing this afternoon and they experienced good Sting Ray action in the Pamlico Sound. Two Blue Marlin, one White Marlin, and four Sailfish were released by our offshore fleet. The Dolphin bite was fair to good depending on location. 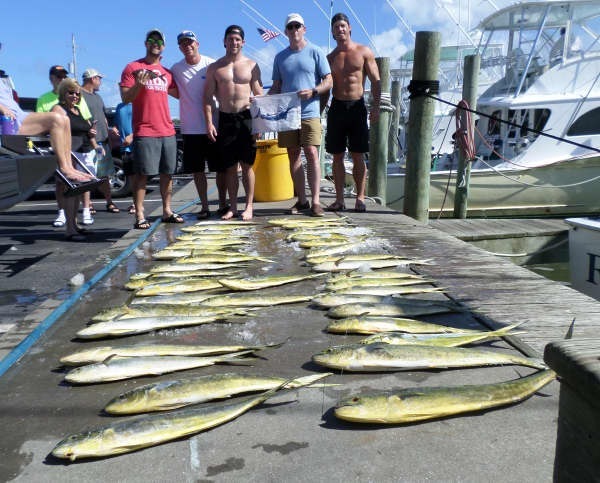 There are so many exciting things to see and do whether you fish inshore, near shore, or offshore. It' a great way to spend time with family or friends and is very educational as well as fun! 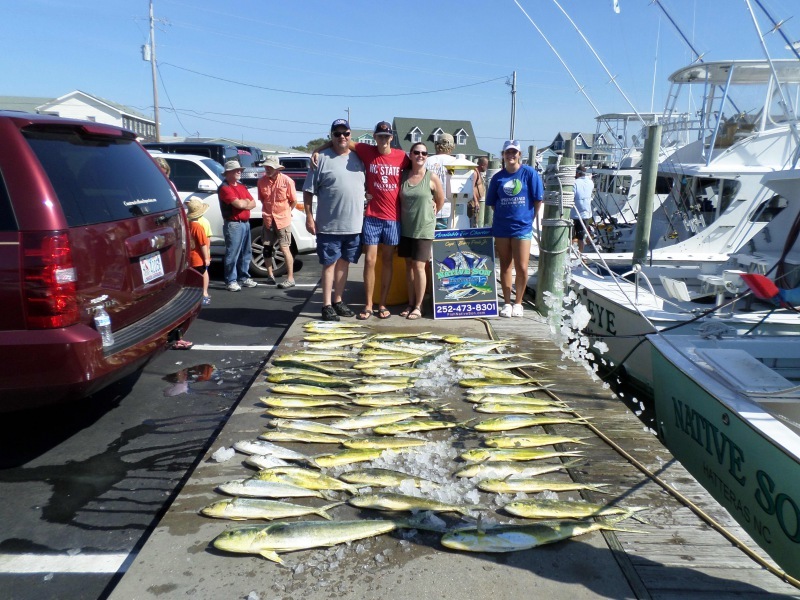 Don't miss out - come to Hatteras Village and participate in the trip of your choice. 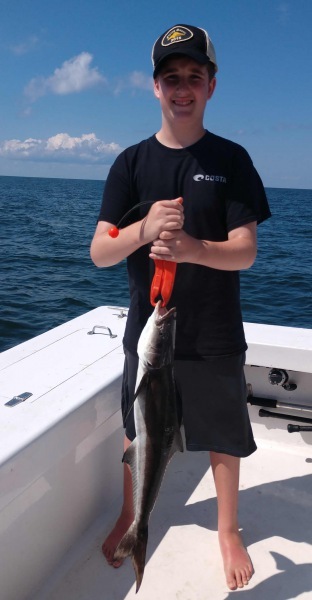 David A. Muntz of Pennsville, NJ: Barracuda release on Predator. 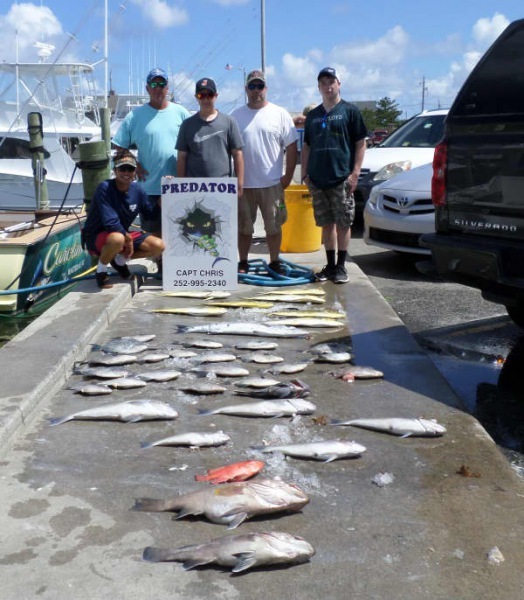 David F. Muntz of Salem, NJ: Sailfish release on Predator. 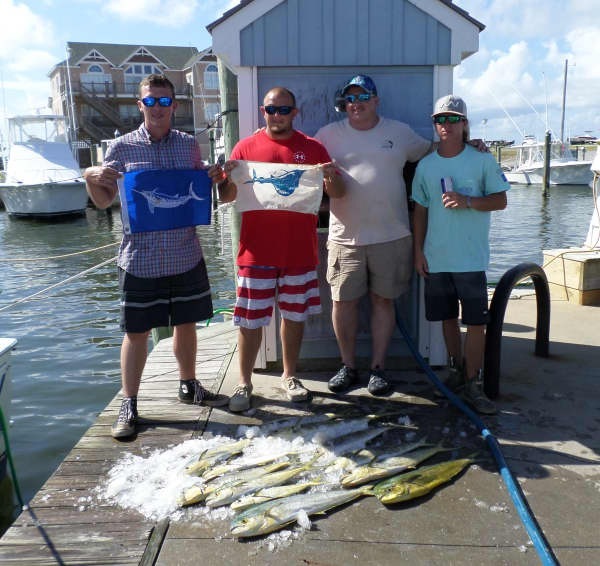 Jarred Pates of Fredericksburg, VA: Sailfish release on Hatteras Blue. 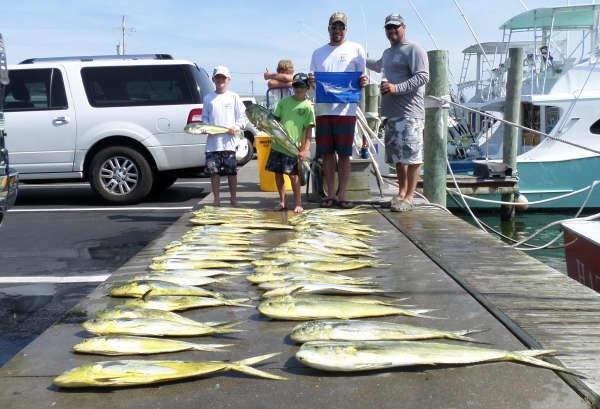 Jacob Matthews of Denver, NC: Sailfish release on Good Times. Keffer Norris of Lutz, SC: Blue Marlin release on Bite Me. 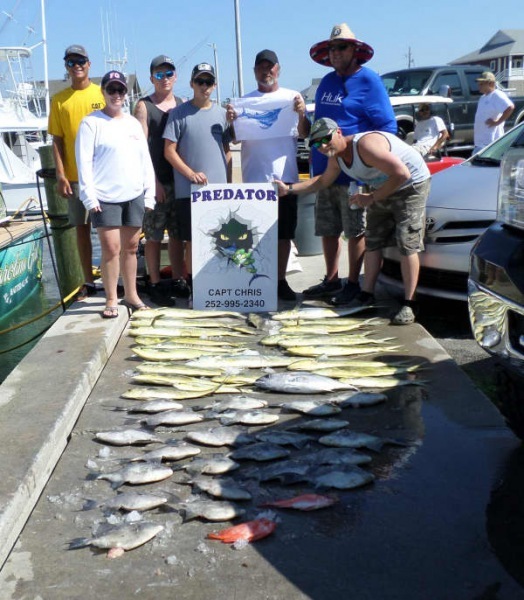 Steve Thompson of Collegeville, PA: Sailfish release on Bite Me. 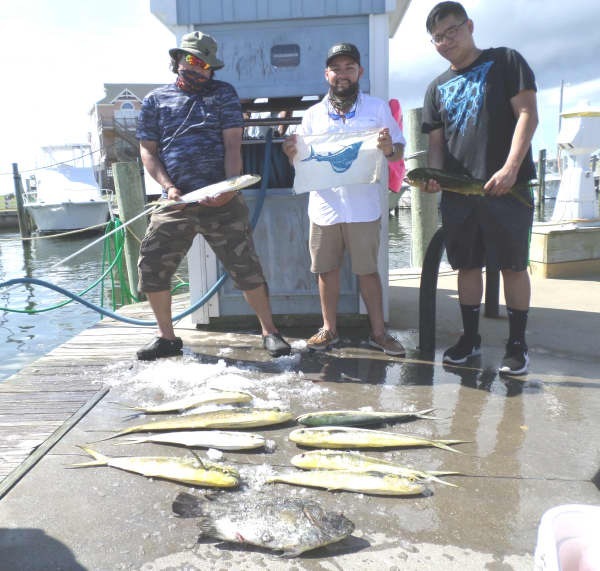 The weather was stormy this morning, but the afternoon brought abundant sunshine and anglers took advantage of the conditions and went out fishing. 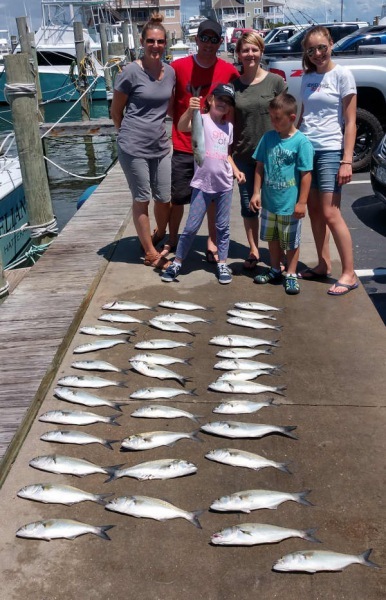 The morning inshore charters returned with good catches of Bluefish, a few Spanish Mackerel and Puppy Drum, and some Cobia. 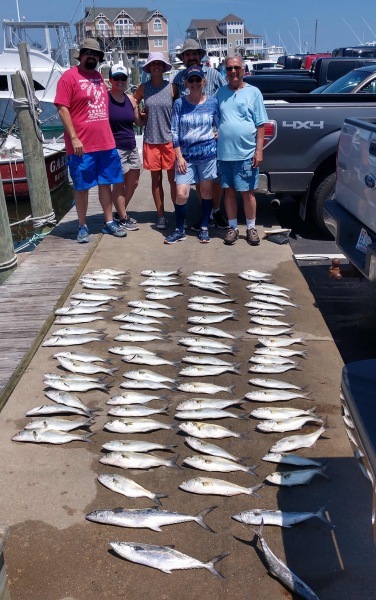 The afternoon charters went out and raked up on clams. Good eating all around! 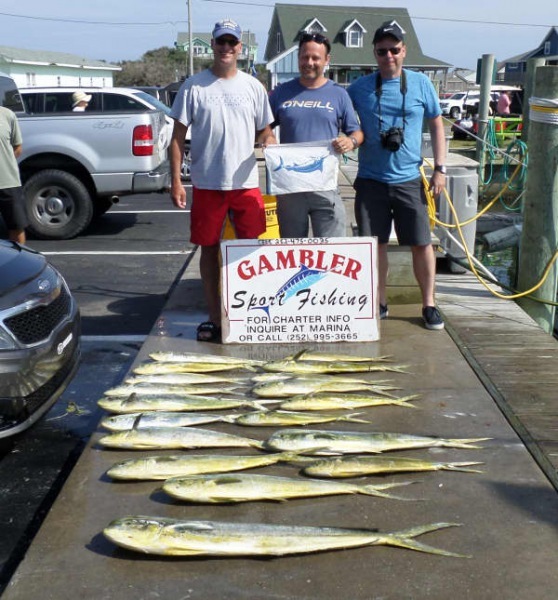 It was an exciting day for offshore anglers. Two White Marlin and one Sailfish were released! The Dolphin bite was pretty good, so they did return with some meat fish. There is no better meal than fresh fried or grilled Mahi Mahi. 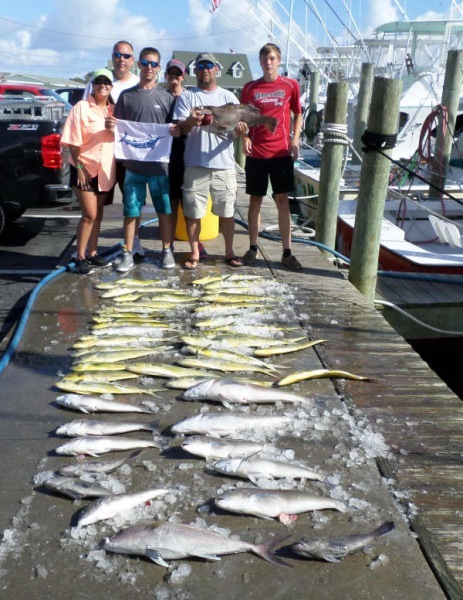 If you've never experienced inshore or offshore fishing, give us a call at 800-676-4939 and we'll hook you up! 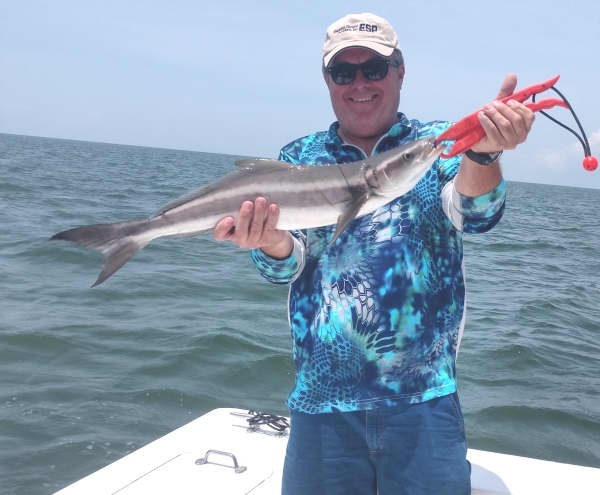 Steven Buhler of Belmont, NC: 61" Cobia on Adventure. Mark Roy of Brown Summit, NC: White Marlin release on Tuna Duck. 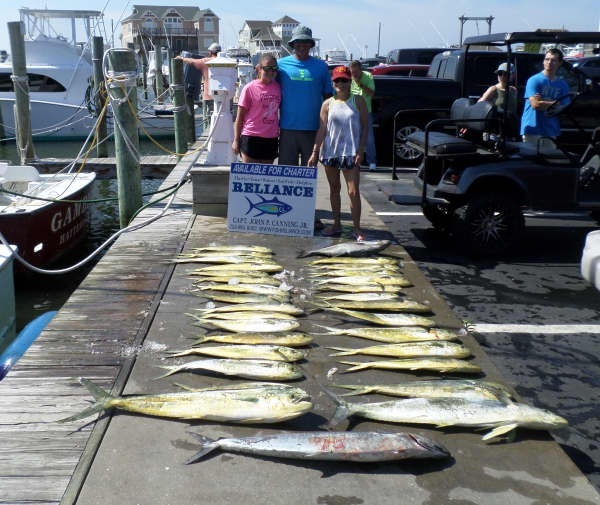 Ashley Williams of Raeford, NC: White Marlin release on Release. Scott Anderson of Wilkesboro, NC: Sailfish release on Bite Me. 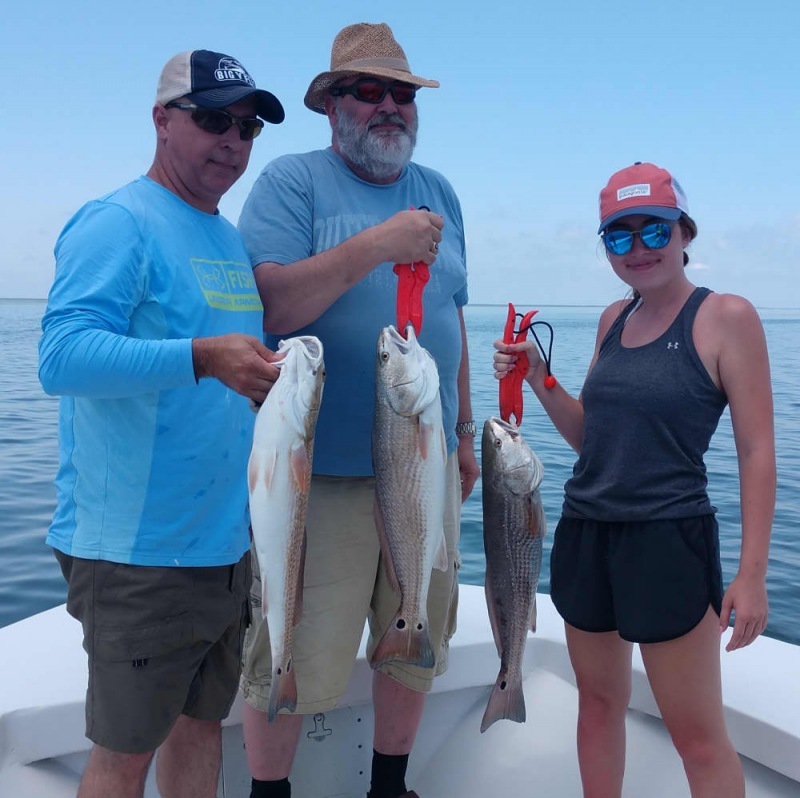 Inshore boats were rocking it out today with Spanish Mackerel, 3-4lb Bluefish and keeper Cobia with a few Speckled Trout. 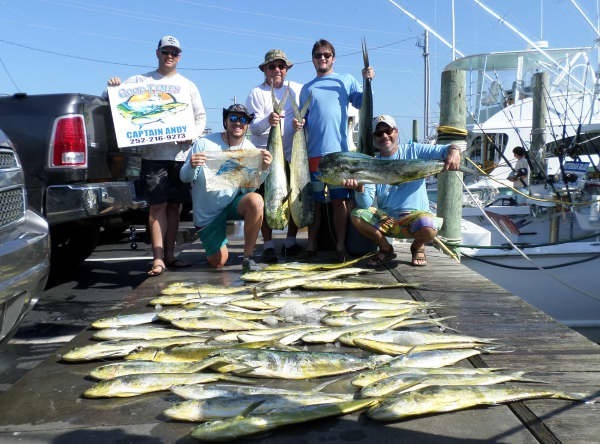 Offshore fleet was out in full force with boats coming back with pretty good Dolphin catches. 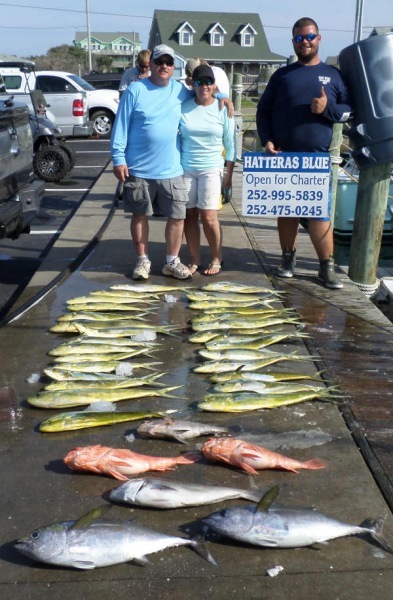 There were also boats doing some bottom fishing that found Grouper and Triggerfish. Big Eye released a Blue Marlin. 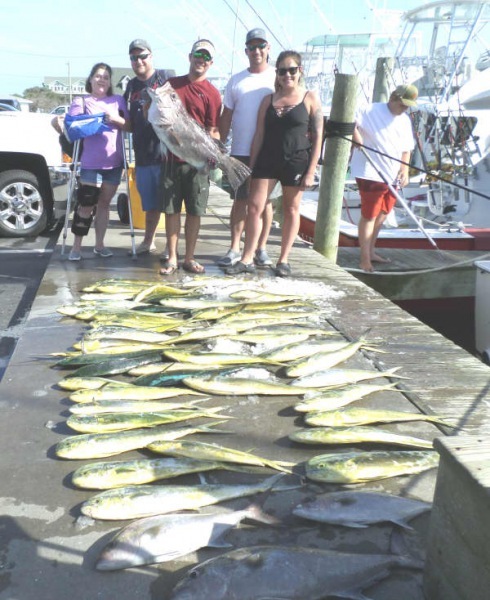 Native Son: Michelle White of Kernsville, NC caught a 35lb Dolphin. Big Eye: Amanda Brenek of Voluntown, CT released a Blue Marlin. Hatteras Blue: Richard Baranowski of Dallas, PA released a Blue Marlin.